Like Professor Baude, I find that the arduous work performed by the framers of the first Indiana state constitution is often underappreciated by the public. The events that took place at Corydon in 1816 beneath the broad branches of the Constitutional Elm are just as important to Indiana as the work of the convention held at Independence Hall, only a few decades earlier, where a similar body of learned men formed our national government. Yet, most Hoosiers have very little knowledge of the events that transpired in Corydon and why. Professor Patrick Baude of Indiana University School of Law – Bloomington aims to right this wrong. 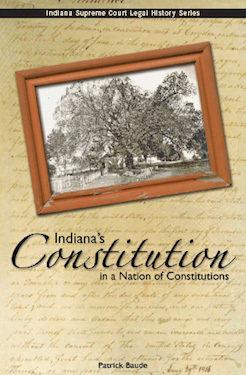 His examination of the 1816 Constitution places it in context with others of its time, and these comparisons to the federal Constitution and to those of other states, provide the reader with a sense of the origins and meanings of Indiana’s first constitution. Professor Baude also brings us to a greater understanding of the historic nature of the work performed at Corydon that summer. The message that this work conveys about the early roots of Indiana’s government is well worth sharing, and the Indiana Supreme Court takes great pleasure in reproducing it for you here.